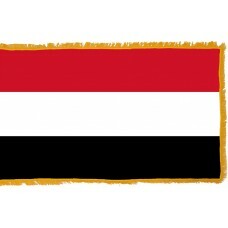 The Yemen Flag features three horizontal bands in the colors of red, white, and black. The red color represents the unity and the blood shed during the battles, the white color represents the country's bright future and the black color represents Yemen's dark history. The colors used on the Yemen Flag are the Pan-Arab colors that represent the Arab unity. The Yemen Flag is derived from the flags that were used on the former North and South divisions of the countries. Both the North Yemen flag and the South Yemen flag included the red, white, and black colors, but each flag had their own symbol on it. The Yemen flag was adopted on May 22nd, 1990. Yemen is a country that is located in Western Asia and it shares borders with Saudi Arabia, Red Sea, Gulf of Aden, Arabian Sea, and Oman. The largest and capital city is called Sana'a. Sana'a is known to be one of the oldest inhabited capital cities as well and the highest capital city in the world. Yemen is a country that has endured much history and invasions and been under the control of many different empires and dynasties, which include the Romans, Ethiopians, Persians, Sulaynid Dynasty, Ayyubid Conquest, Rasulid Dynasty, and the Ottoman Empire, as well as coming under British control. The Ottoman Empire ruled Yemen from 1538 until the collapse of the Empire in 1918. Following the collapse of the Empire, the Northern part of Yemen was ruled by the Imams until 1962 and the Southern Port of Aden was a British Protectorate until 1967. On May 22nd, 1990, the two republics united after 300 years to form the new nation. Yemen's economy is very poor and very reliant on its exports, especially oil. Yemen was a popular tourist destination until the 2011 Yemen crisis. The main attraction in Yemen is the 16th century city of Shibam which is also referred to as the "Manhattan of the Desert." As well as being home to plenty of desert landscape, it is also home to approximately 500 towers that are made of mudbrick. The historic town of Zabid is also another popular attraction. Zabid was the capital of Yemen between the 13th – 15th century and it is one of the oldest towns in Yemen. Zabid is home to the "Great Mosque of Zabid" which was built in 628AD by a follower of Muhammed, "Abu Musa Ashaari." The old city of the present capital, Sana'a, is one of the oldest inhabited cities in the world, and, according to legend, the city was founded by the son of Noah, Shem. It is home to some of the oldest buildings in the country that include "Samsarh" and the "Great Mosque of Sana'a" that are approximately 1500 years old. This city also features over 100 mosques, 12 baths (also known as hammams) and 6,500 houses. Remember, through my joy, each march. In faith and love am I part of mankind. An Arab am I in all my life.